Based on baobab trees. Legend has it these trees stood so tall and proud that they made the gods angry. As a result the gods plucked them and planted them back in the earth upside down. Assuming that is true, my variant is the Downies. These trees, cursed by the gods to grow upside down, strain toward the center of the earth. Often rotten inside, they form tunnels through which people may descend into the earth. (Or darker things ascend!) It is said that these trees are seeking vengeance against the gods. When they reach the molten lava that ever scholar knows is at the center of the earth, it will quickly burn through their hollow wooden skins and cover the earth in fire and ash. Attacks (none), 40 HP, 3 Armor. Instinct: to reach the center. When the mad wizard Kitchikeeyu asked the Holy Empress Light-of-Twelve-Stars for some land for his tower, she offered him a secluded birch forest far from the Blessed City. As we all know, land freely given always comes to no good. Because she is wise, The Most Beloved Empress sold it to him for half a penny. The twisted old sorcerer wasted no time making a mess of things! In one day, he summoned a strange, blue-stone fortress for himself and began his studies in transformation. All manner of creatures were warped and molested by his cruel magic. At last, thinking he’d gained enough learning, he transformed himself into a great eagle and launched himself from the tower wall. Nearly crashing to his death, Kitchikeeyu found flying quite difficult and careened around the forest flapping for all he was worth! Finally, the desperate eagle was able to land in a birch tree. Too afraid to fly again, Kitchikeeyu decided to turn back into himself so he could climb down. Unfortunately, he knew nothing of how to return things to their proper forms! Instead, his unsavory magic pulled all the life forms at hand and, along with some flawed memory of his original shape, blended them all in together! Now children! DO NOT GO into the Half-Penny Forest unless you want to come face to face with the mighty Birch Ogre! It is tall and slender! It is covered in pale and peeling bark! It has the head of giant eagle! It walks on two legs with feet covered in flailing roots! It swings a multitude of powerful, whip-like branches, laying waste to anything it meets! It has the predatory instincts of a raptor with the stomach the size of a tree! Contact us through the Anchor mobile app or at monsterbrotherspodcast@gmail.com. Kobeleons are a variety of kobold adapted to the deep forest. They are excellent climbers and employ a prehensile tail in their maneuvers through the canopy. Their long sticky tongues allow them to reach and extract objects with incredible speed. It is very difficult for anything to escape their notice due to their sharp eyes that move independently of each other. On the other hand, it's almost impossible to see them when they are motionless because of their ability to blend in with their surroundings. They defend their territory with hit and run (or hit and hide) tactics, keeping to high perches and striking with blowguns and other basic missile weapons. It is rumored that a green dragon controls much of the uncharted forest and the kobeleons are her servants. The elite fighting force of The Kobold Capital City of Kor-Moleg are known as the Exalted Knights and considerable resources and efforts go into outfitting and maintaining them. Each wears armor that is warded against magical attacks. Each has bonded with a Dire Badger mount and their gear fits together in a way that allows the rider to maintain a seat while tunneling. Lastly, each knight wields a flaming short sword that may continue to do damage if the wound is not doused or smothered. The knights themselves are committed warriors with years of intense training. Several of them are adept in the arcane arts and will cast battle magic if allowed the time. The Armored Dire Badgers of Kor-Moleg serve as mounts for a Powerful kobold fighting force. They are the epitome of harnessed rage! Instinct: Shred the enemies of my rider! This evolved species of bugbear is even taller and harrier than it's progenitors. 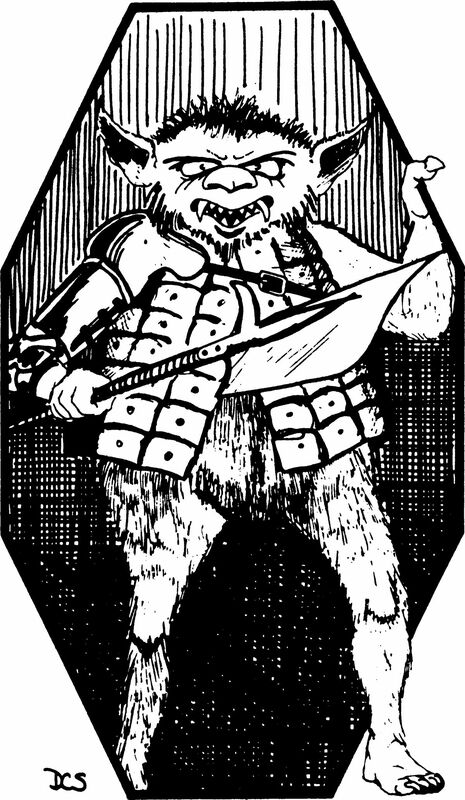 Surprisingly, given the odious habits of standard bugbears, the Bigfeet are evolved in mind as well as in body. They are quite intelligent and use violence only as a last resort. Harried by so-called civilized people who can't see the difference between the Bigfeet and their low-brow cousins, they have retreated into seldom-travelled corners of The Wild. Most live alone, wandering a well-defined territory, but once a year, on the longest night, they gather together for a night of revelry in which they descend into their more savage natures. Having spent this energy, they go their separate ways in the morning and don't like to talk about what happened with each other, let alone outsiders. Some are killed at these revelries. But also there are unions that bear fruit. Move: know every leaf and stone of their territory, read the stars, lose control of their temper. They call him Old John Broken Teeth and he’s killed many a lonely traveler along the narrow forest road to Hillbrook. The few survivors who claim to have seen him say he’s taller than a rearing horse but his body is thin and covered in dark, greasy fur. They claim his mouth can open wider than your shoulders and it’s full of jagged teeth. What they don’t know is that John is just one of several large predators that hunt in a pack but rarely reveal more than one of them at a time. Their usual tactic is to frighten their prey by leaping out at them and then slipping back into the woods to allow for partners to do the same. When the victim is worn out, they close in and make the kill. She appears when time is short and the traveler is eager to move on. At first sight she looks like an old woman lying in a ditch. Upon closer inspection, her nose is inhumanly large, she has a mouth full of sharp, finger-length teeth, and a tail like a cow’s can be seen pinned under one leg. The frightful creature will wail and cry, telling the adventurer that she’s fallen ill and her mother is looking for her. The hero will hear the voice of a woman in the distance fussing over her lovely daughter who is missing. The troll in the ditch will ask for the sap of seven trees that are scattered throughout the woods. The first character to commit to helping her will be rewarded with one reroll per session for which they need to describe how the elements shift to help them. Today their realm is a terrifying desert of harsh winds and sliding dunes, but once it was a lush, dense forest. The elves dwelled in it, and as happens with places they dwell in, the trees began to awake. But nearly two centuries ago the desert to the south began encroaching on the forest. Why did the climate change? Did it have anything to do with the rise of The Bone Lord? Who knows. The trolls of the forest remained, walking among the ghosts of trees that can no longer be seen by anyone but themselves. 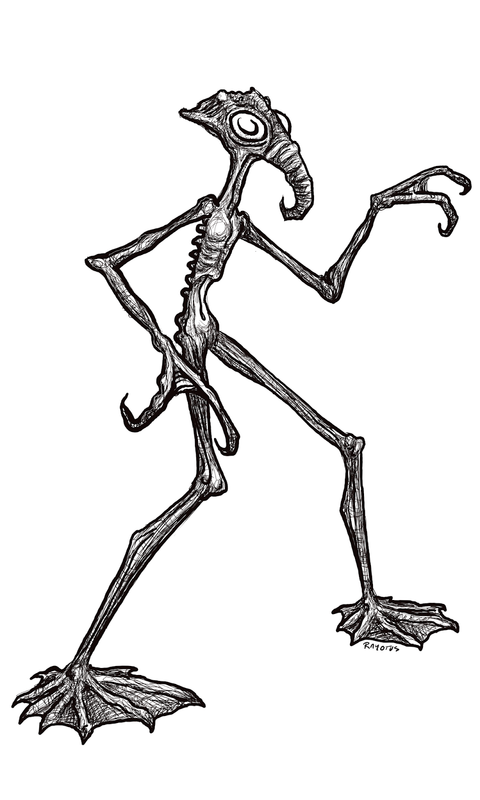 They are tall and thin with whipcord muscles and splayed feet. They have lost their voices and speak only with slow, weaving gestures of their long arms and spidery hands. Humans call them the sand stalkers because they gather around interlopers to drive them out. The elves call them the Guardians. Either way, interlopers disturb the ruminations of these strange creatures, disrupting their connection to the spirit world by simply interjecting a focal point of reality. 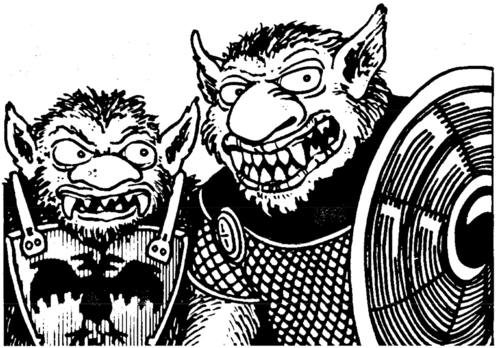 The trolls always want to drive out other intelligent species not indigenous to the area – by force if necessary.